Don’t look at it! Never look at it! Legend tells of a great ring of immense power and dark beauty that calls out its siren song to unsuspecting victims. The reach of this powerful object knows no bounds, instilling in men an unrelenting compulsion to possess it, regardless of cost (but it should cost). This compulsion usually arrives around the same time a man finds himself with disposable income and an established 401k, along with his own car and, preferably, a nice apartment. And he doesn’t live with his parents. This is the cautionary tale of one such man. Jeremy … MojoFiction … okay, so there was this guy and he was twenty-something, young and free. He had been courting a lovely young lass and things seemed to be going well. So he did what any reputable guy would do. He said, “I shall marry this girl as soon as practicable.” He didn’t say this out loud of course, because “practicable” is open to broad interpretation, but also just in case Scarlett Johansson came back on the market and he needed a quick out. Because this was his dream girl, he couldn’t just go to one of those jewelry stores in the mall (YOU go to Jared). He knew his girl deserved the absolute best that he could fit onto his Discover card. As our hero was living in Chicago, he did what every guy would do when that moment arrived: He travelled to the mythical land called Jeweler’s Row. For those of you who don’t believe the tales of Jeweler’s Row, it is the name of a block of Wabash Street full of jewelry stores. It’s a like a spy thriller to visit, as they will only buzz you in after determining your credit rating via fingerprint analysis. Once in, they’ll show you spreads of solitaire diamonds they unroll on a silky cloth pulled from a safe. They’ll watch you very closely as you inspect the stones and they’ll assure you of the color and clarity of each stone. Selecting the diamond is one thing, but it’s the setting that really counts (also, the diamond really counts). This particular young man gravitated to the white gold rings for the simple reason that over the course of their relationship, his girlfriend would state at seemingly random times that what she really likes is white gold jewelry. It was very mysterious, but who understands women? 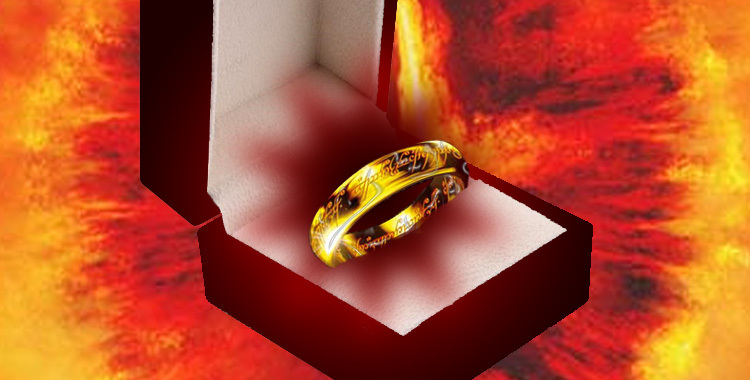 Hearing the siren song of the ring, the man, with credit card shaking in his hand, bought the ring and center stone. The jeweler placed it in a white box and the man ran home with it. Immediately he was surrounded by fifteen sales people, despite only three working there. The day finally arrived and he asked the question. Two questions, really. The first one was, are you sure you want Italian for dinner? They always ate Italian. What’s wrong with a cheeseburger or something? The second question, though, is a monumental moment. There he was, asking someone to hang on to the reigns with him as they ride headlong into a future starkly different than when they were single. He wants her to be the mother their children, he wants her to agree emphatically with him when he whines about his co-workers even though he sounds like a childish brat, he wants someone to be there with him for every adventure and every failure, and he wants to do the same for her, to validate both of their lives lived only for each other (and for the Chicago Cubs – they are his mistress). Naturally, she said yes. You would have, too – he was magnificent. Did we mention the diamond ring? He slipped the ring onto her finger, grateful that it fit. She took one look at the ring and suddenly let out a long and troubling sigh. Men you know that sigh. It’s a deep, rumbling thing, like the drums in the depths of Moria heralding your doom. It’s the sound of utter failure and oncoming despair. At this point, he did what any man would do in this situation. He went full on deer-in-headlights. She seized the opportunity to lay into him about it, about how she always dreamed her engagement ring would feature a princess-cut diamond and how he should have known and now he’s crushed her very soul. He had to stop her and ask if they were still engaged. You know, because of all the deeper meanings of their future together. He seemed to remember that being part of the equation. She admitted they were still engaged. Years later, when asked why he ignored the bright red flags raised by his girl’s reaction to the engagement ring, our hero said he knew what every man knows in that moment. He knew he was about to get the best action of his life. So the siren song of the ring continues, drawing new victims to their fate.